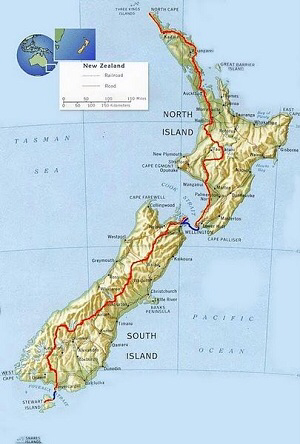 Te Araroa - New Zealand's Trail - is a continuous 3,000 km walging track from Cape Reinga to Bluff. Te Araroa is the ultimate 5-month New Zealand experience. It is a different kind of trail from the traditional back-country tramping tracks. Te Araroa connects settlements, townships and cities. It's a corridor that encourages social and economic transactions en route – for marae stays and other cultural experiences, also food and accommodation. The track corridor showcases a wide variety of New Zealand experiences - natural, cultural, and historic. Te Araroa’s boundaries are the natural boundaries of New Zealand itself. It starts and is brought to a natural halt against the sea. En route it explores New Zealand’s tombolos, its volcanoes, its range and mountain uplift, its rivers, lakes and valleys. Successful long trails overseas generally have a geographic and geological unity. Te Araroa’s variety is underpinned by the mightiest geology of all – tectonic plate subduction. When walking New Zealand, you are walking also the Pacific Plate boundary or – at least sometimes – along the Rim of Fire.